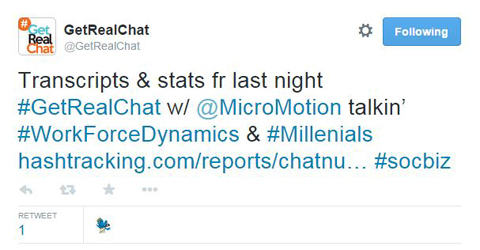 Does your business participate in Twitter chats? While it may be more challenging for businesses to participate in chats from behind a logo, it can be done. In this article I’ll explain how to engage in Twitter chats as your business, so you can grow your network. 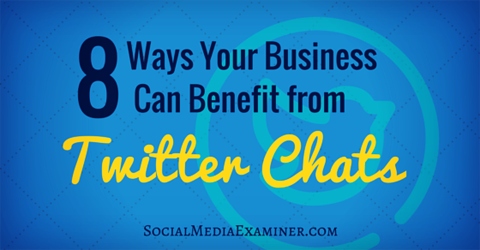 Discover 8 ways businesses can benefit from Twitter chats. The biggest issue a business has with participating in a Twitter chat is that the majority of participants are individuals. Humanize your brand’s Twitter account in order to make a deeper connection. For example, include the Twitter handle or name of the community manager who handles your brand’s Twitter account in the profile’s bio. That way, participants will know whom to address when they respond to your tweets. 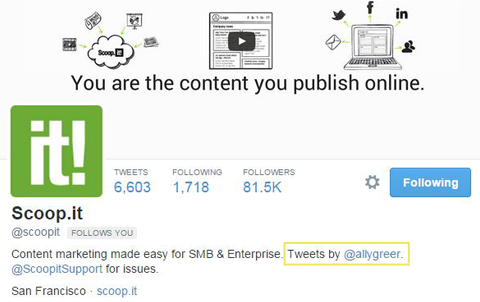 Like Scoop.it, provide the name of your community manager in your Twitter bio. Another option is to put a group photo of your employees in the Twitter header or background image. 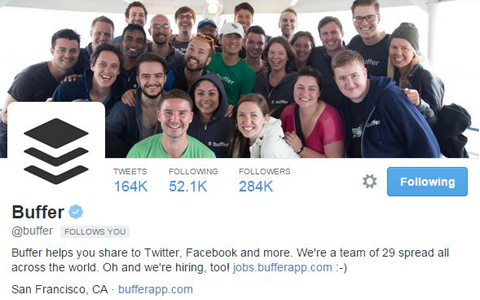 Introduce your employees, as Buffer does, in your Twitter header image. When you match faces to your business, it personalizes your image and makes your brand more approachable. There is usually a high volume and frequency of tweets during a Twitter chat, so it’s easy to get overwhelmed. Take steps ahead of time to get the most out of the chat. Research and then choose an industry-aligned Twitter chat to join. Next, connect with the chat’s community. Start by familiarizing yourself with the hosts. To find the host, perform a Twitter search using the chat’s dedicated hashtag. Then, click on the people results and look for the Twitter chat hashtag in their bios to find out who’s the host. Follow the hosts and @mention them via Twitter to introduce yourself. 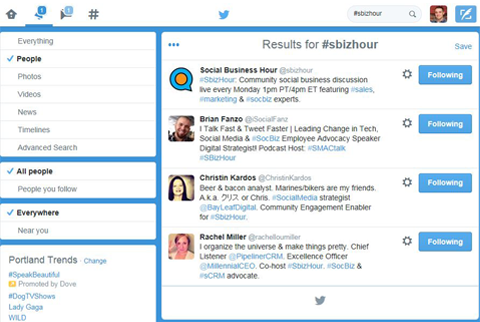 Perform a Twitter search to locate the hosts of the Twitter chat you want to join. After you make your initial connection, strategically prepare for the chat itself. Most Twitter chats usually follow a Q&A/interview format with preset questions regarding a specific topic that will be discussed. Many times these questions will be publicly available well before the Twitter chat takes place, either on their official website or posted elsewhere. For example, #CMGRHangout hosts a Twitter chat coupled with a live Google+ Hangout on Air. They provide their list of questions in the event invitations they send out to their community members. 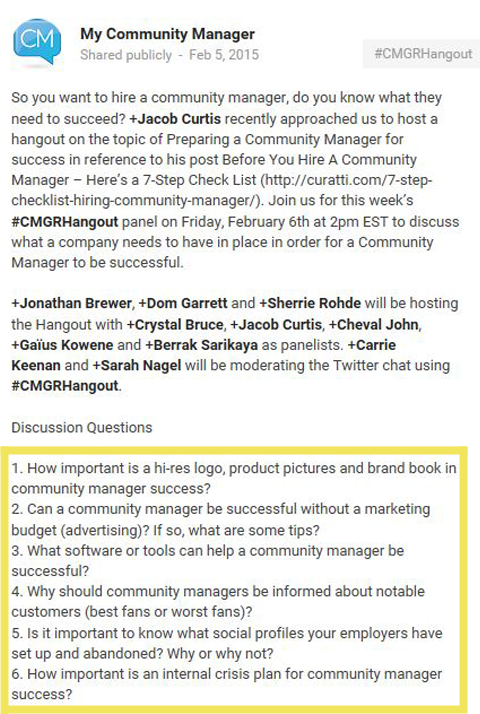 See if the Twitter chat, like #CMGRHangout, shares their discussion questions ahead of time so you can prepare. Once you know the questions, prepare for the Twitter chat by writing down the answers that you’ll be sending through your brand account. There are several benefits on preparing your tweets. First, it’ll give you enough time to draft your best answers and keep them well within the 140-character limit. Plus, you’ll be able to share them with your team for review, if necessary. Also, by preparing your answers early, you will have more time during the actual chat to engage as your brand. List all of your answers in a handy Word doc, making sure to include the Twitter chat’s hashtag. Then just copy and paste them as tweets once the question is asked during the discussion. When you make friends with the hosts and provide value during their Twitter chat, it’s likely they’ll take notice and reciprocate by sharing your content. This will further help your brand integrate into the community. Contribute to the chat even before it starts. Retweet and share details via Twitter days, hours and/or minutes before it starts. Support the chat by tweeting about it ahead of time. Don’t forget the hashtag. This tactic shows the host that you support their event. Plus, it places your tweets into the Twitter chat feed, which participants will also see. Since you prepped answers ahead of time, it’s a cinch to participate in real time. In addition to answering questions, add value by sharing stats and quotes related to the topic. For example, come up with statistics and links or a list of famous quotes that relate to the topic. To really stand out, prepare shareable images or quote graphics to go along. 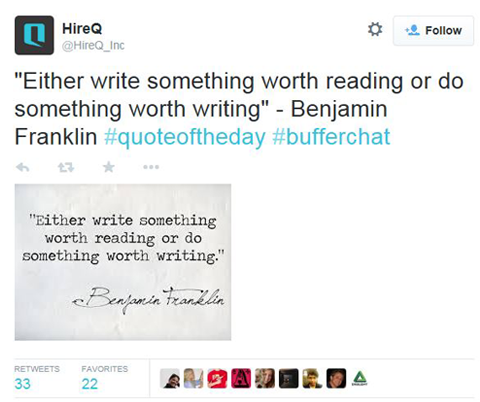 A well-timed quote graphic tweet really adds to the value of a Twitter chat. If you create images fast, go a step further and make a quote graphic based on something that was tweeted during the chat. When done correctly, this tactic can help your brand break through the busy Twitter chat stream and get noticed. This form of brand engagement will also show participants that you’re actively involved in the conversation and not just broadcasting answers. 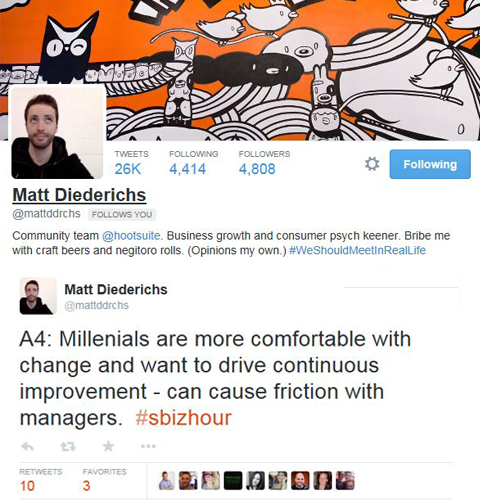 Activate, empower and encourage employees to participate in the same Twitter chats as your brand. This will generate additional brand exposure, while giving your business human points of contact within the community. Generate more exposure for your brand by having additional employees provide value during the chat, the way Matt from Hootsuite does during #SbizHour. Asking employee advocates to participate in chats is a fantastic way to support your brand’s Twitter engagement efforts. 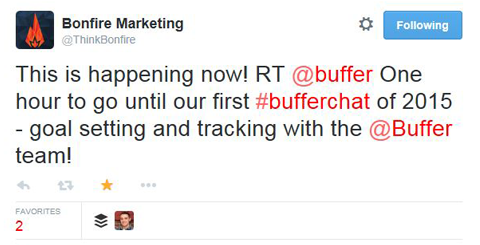 Brand engagement doesn’t have to end when the scheduled Twitter chat does. That’s one of the best things about Twitter chats being archived by hashtags. Search the hashtag to find out what and whom you missed. Follow and thank the host and guests; follow the other participants and influencers from the chat as well. Also, retweet and respond to some of the messages you may have missed. Many Twitter chats will even provide a convenient recap or transcript of the event, which is also valuable to retweet. Many chats will offer a transcript after the Twitter chat, which you can retweet to your followers. Also, take time after the Twitter chat to RSVP for the next one. Still having reservations about participating in a Twitter chat as your brand? Consider sponsoring one. When you ask to become the sponsor of a Twitter chat, you build brand awareness without even being there. The hosts usually mention sponsors before and after the event. Keep in mind that brands sponsoring Twitter chats and participating in them see the best engagement results. 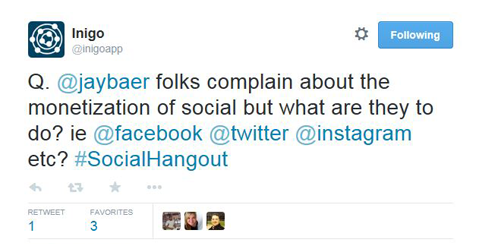 Inigo sponsors #SocialHangout and engages as their brand during the Twitter chat—an effective combination. Another alternative to participating in someone else’s Twitter chat is to simply create and host your own. Buffer is a great example of this in action. 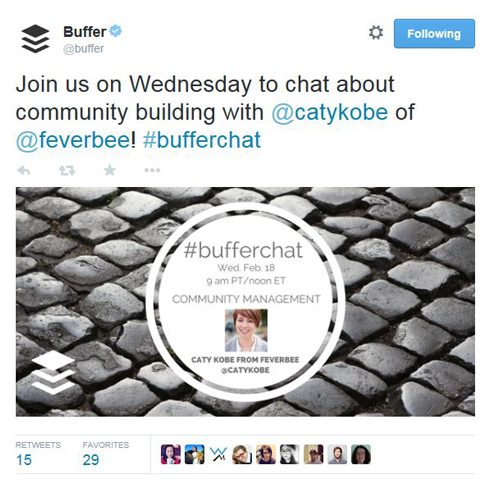 Buffer created their own Twitter chat to develop a deeper relationship with their community. A Twitter chat is basically just a community that meets regularly to talk shop. Engaging in a Twitter chat as your business is a great way to connect with influencers. And there are also benefits to connecting with other brands and peers. Remember to be patient and develop individual relationships that make sense for your business. To find real success from engaging in a Twitter chat as your brand, you need to remain engaged with its community and keep up with them regularly, like during the next scheduled Twitter chat. What do you think? What are some of your favorite Twitter chats? Have you found success engaging in chats as your brand? Which brands do a great job participating in Twitter chats? Share your thoughts and recommendations in the comments below. A digital native, Jacob has studied and participated in the evolution of social media as a preferred method of communication. In his free time he produces video tutorials on social media.